Make traveling a more enjoyable experience. Travelers expect quite a bit from the hotel experience. Not only is it important to have a comfortable place to sleep, amenities such as ice, hairdryers, irons, and breakfast are expected as well. Most hotels have staff members who are willing to accommodate even the most finicky guest. Now it’s time for travelers to brush up on how to behave. Make your reservations as far in advance as possible. Waiting until the last minute, you run the risk of the hotel being booked, not getting the accommodations you prefer, or being placed on a waiting list. The day before you are scheduled to arrive, print your confirmation or call to make sure you are still on the roster. If you plan to travel with a pet, let the reservationist know. Some hotels don't allow pets, while others may have policies regarding the size and breed of the animal. If they can't accommodate you, they may know of another hotel that can. Have your confirmation number available. Go directly to the registration desk with your confirmation information and give the names of everyone who will be staying in your room. Be prepared to do quite a bit of tipping throughout your stay at the hotel. Treat all the furniture and fixtures in the room with care. These are not your personal belongings, and the hotel has reasonable expectations that you will leave them as you found them. If something is broken or doesn’t work, contact the front desk and let them know right away. Waiting can lead them to believe you broke it. Be a good neighbor and keep the noise down. This includes voices, television volume, music, and anything else that can disrupt the rest and relaxation of others. If someone else is noisy, contact someone at the front desk and let the hotel staff deal with it. You don’t need to confront other guests with problems. Never take reusable items when you leave. You may take consumables such as shampoo, conditioner, soap, and lotions. However, bathrobes, towels, dishes, glasses, mugs, coffee pots, and other objects are there for use only during your hotel stay. If you like something and want one to take home, contact the front desk and ask if they have one that you can purchase. If you remove an item, you can pretty much count on being billed for it later. Be respectful of the people who clean your room. Remember that they have a whole row of rooms that need to serviced, and you don’t want to slow them down. Never answer the door unless you are fully dressed. Don’t get into a personal discussion with the housekeeping staff. If possible, leave the room when the cleaning staff arrives. If you can’t, ask them to return later. Make their jobs as easy as you can. Before you leave the room for the day, put your dirty towels in a pile on one spot of the bathroom floor. Don’t leave trash lying around. Dispose of it in trash receptacles. Be as quiet as possible when walking down the hall to or from your room. If you need to talk with someone, use a soft voice. Remember that noise echoes in hallways, and the sound may be amplified in the rooms. Try to refrain from talking in the hallway after 10:00 PM and before 8:00 AM. Once you get to the elevator, be respectful of others who are getting off or waiting to get on. Once you are inside, wait for others to load before pushing the button for your destination floor. If you have bags, push them as close to the wall as possible and get out of the way of anyone who needs to get past you. Don’t allow your children to play with the buttons on the elevator. Many hotels have pools, Jacuzzis, and workout rooms. Read the rules before using them. Be considerate of other guests. If someone is waiting for you to finish using a piece of equipment at the gym, don’t dilly-dally. Always supervise your children in pool and workout areas. Not only can they get hurt, they can disrupt or injure someone else if they engage in horseplay. Many hotels have your checkout information on closed circuit TV that can only be seen inside your room as well as a printout that is quietly slipped under your door early on the morning you are scheduled to leave. Look over your bill to make sure all your charges are accurate. If everything is fine, you don’t have to do anything but leave your key in the room when it’s time to depart. If there is an issue, politely call the front desk and discuss the issue until it is resolved. Call the porter station to let them know what time to pick up your bags for departure. If you need to store them due to late departure, they will give you a ticket to claim your bags later. If you are ever in doubt about proper etiquette, follow the general rules of proper etiquette. Smiling, saying “please” and “thank you,” and having a positive attitude will show your good manners wherever you are. Everyone at the hotel, including staff and other guests, deserve your respect and kindness. 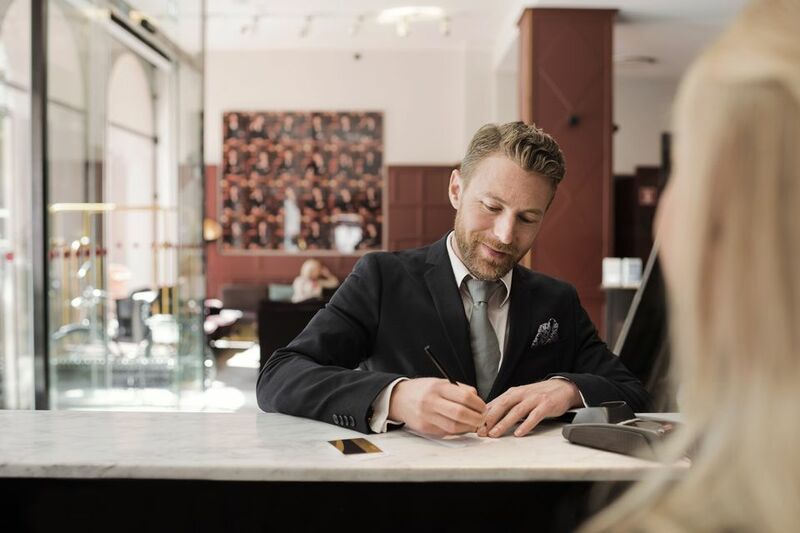 If you have a question about what is expected, the person at the front desk or the concierge will be glad to help you.